Hattori Racing Enterprises’ owner, Shigeaki Hattori, announced today that the team will be scaling back in the NASCAR K&N Pro Series and running more NASCAR Nationwide Series races. Hattori’s first attempt at the Nationwide Series far surpassed expectations. The HRE No. 80 Goodyear Toyota, driven by Johnny Sauter, surprised many by qualifying 9th for season opener at Daytona International Speedway, and then ran well for the majority of the race. HRE is sponsored by a number of Japanese companies, many of whom were impressed with HRE’s first Nationwide Series start enough to provide support for future races. 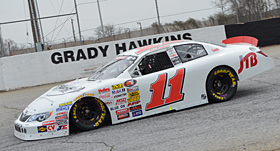 Several companies have decided to shift their sponsorship from the HRE’s K&N Series cars to the Nationwide Series car. HRE will continue to enter the No. 1 Big Machine Records Toyota in select NKNPSE races with David Garbo Jr. behind the wheel. The next race for the No. 1 is the Casey’s General Stores 150 at Iowa Speedway on May 17th. The next Nationwide Series race for HRE will be the History 300, May 24th at Charlotte Motor Speedway. Johnny Sauter will once again be piloting the No. 80 for the Charlotte race. HRE will announce future schedules as the season progresses. Stay up-to-date with Hattori Racing Enterprises on our Facebook Fan page, and follow us on Twitter @HattoriRacing, Instagram @hattori_racing_enterprises, and on Google+. The HRE team will only field one car in K&N and the 11 ride of Lee Pulliam will be shut down for the year.